574E Legion and 574C tournament champs at East Jay tournament. 574E Paul Scott, Jackson Coverstone and Connor Byrd. 574C Micah Rassi, Joe Kelsheimer, Evan Rassi and Nick Murphy. JAY COUNTY — “This was Wawasee’s most dominant showing so far this year,” said coach Jed Wandland. The Iron Pride has grown to 13 robotics teams and all of them made it to elimination rounds at the East Jay County VEX Robotics Tournament. Wawasee’s robot skills scores also improved throughout the tournament with the Iron Pride earning the top five places in skills and the 574C team breaking the world skills record once again. 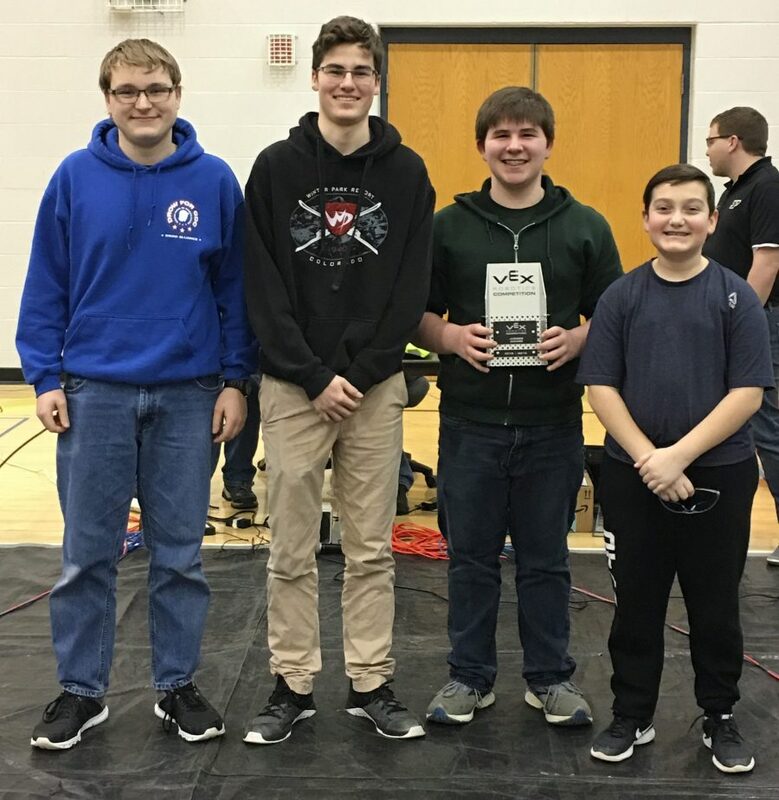 Wawasee Iron Pride Robotics will be at Triton Central Middle School Saturday, Feb. 16. The address is 4740 W. 600 North, Fairland. There is no cost for admission. Opening ceremonies at 9:15 a.m., qualifying starts at 9:30 a.m., finals at approximately 3 p.m.
Saturday, Feb. 9, at East Jay County Middle School, Wawasee Iron Pride took the tournament championship, design award, judges award and skills championship. 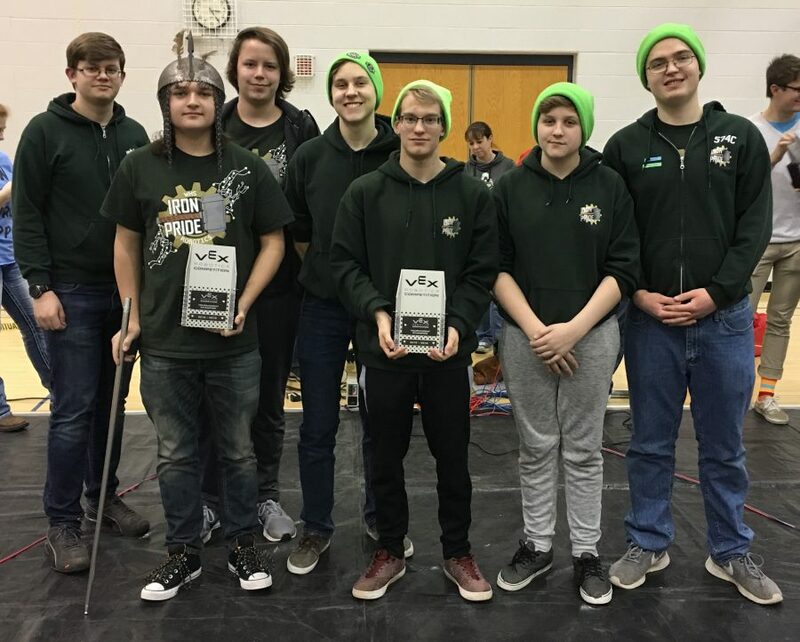 Wawasee’s Iron Pride 574C and 574E allied in the elimination rounds to take home the tournament championship trophies. 574D earned the judges award. The judges award is presented to a team the judges determine is deserving of special recognition. Judges consider a number of possible criteria for this award, such as team displays of special attributes, exemplary effort and perseverance at the event, or team accomplishments or endeavors throughout the season that may not fit under existing awards, but are nonetheless deserving of special recognition. 574C earned the design award. The design award is presented to a team demonstrating an organized and professional approach to the design process, project and time management and team organization. 574C brought home the skills championship trophy for the ninth consecutive time this season. All 13 of Wawasee’s 13 robotics teams made it to the elimination rounds. 574H and 574G eliminated 1193R and 21973B (23-10). 574P and 586H won against 21973D and 21973A (12-8). 574F and 1193Z beat 54021D and 54021A (21-4). 574N and 574J triumphed over 574G and 586G (30-9). These teams all had a bye to quarter finals: 574C & 574E, 574M & 574A, 586A & 586B, 574K & 574D. 574C and 574E won over 574H and 574G (29-3). 574M and 574A beat 574P and 586H (32-5). 574F and 1193Z cleaned up 586A and 586B (16-11). 574K and 574D won against 574N and 574J (21-13). 574C and 574E beat 574M and 574A (33-5). 574K and 574D eliminated 574F and 1193Z (28-11). In a match where 574E drove over a cap early in the timed event, 574C and 574E narrowly won over 574K and 574D (19-17). 574D Judges Award Jack Collins, Noah Beckner, Wesley Hays and Nathan Smith. Not pictured – Cory Dunivan.